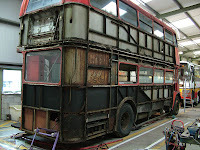 The extensive restoration of London RTW335 is progressing well at the BusWorks. Commissioned by Ensignbus, the bus arrived with us in late November and already the bus is stripped down and rebuilding work well in hand. View RTW335's own blog at http://www.rtw335.blogspot.com/ and keep fully up-to-date with its restoration. The view opposite was taken in December 2009 - much has changed since!